July 6, 1994: Toronto: Anyone who says "getting there is half the fun" never tried driving to Toronto's CNE Stadium on the same night that one of the massive "Symphony of Fire" fireworks displays is lighting up the night sky over the lake-shore. The motorists on the two main freeways that parallel the waterfront were purposely inching along with radios tuned to the simulcast so as to enjoy the fireworks display without parking. Lane restrictions on the lake-shore due to the erection of concrete barricades for the impending Inde race added to the traffic chaos. Even before the nightmare 2 hour 20 Km trip from the freeway to the stadium to review the concert, getting in contact with the right people had been a chore on it's own. As reported in the last edition we had several phone conversations with Manfred Rocha of Rocklight in Van Nuys well in advance of the concert. As the concert day approached our messages left on Manfred's answering machine went un-returned. Fortunately one my sources was able to provide Rocklight's Mark Lowman's cellular phone number. A couple of calls later and Mark kindly arranged a backstage pass. I have been a fan of Pink Floyd since my teenage years. One of my earliest record purchases was Umagamma and the battered and torn double album still lurks in the depths of one of my milk crates of vinyl. I have avidly followed the band and the solo career of Roger Waters even attending his "Pros & Cons" and "Radio Chaos" concerts. 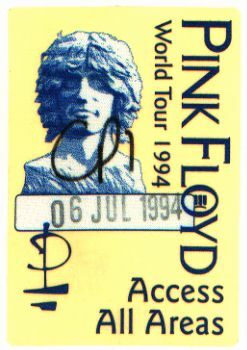 Since Pink Floyd concert tours were so infrequent (until recently), I had never seen them play live until the "Momentary Lapse" tour visited Toronto. I went to the "Momentary Lapse Of Reason" concert and was frankly disappointed. Not that the visuals, varilights or special effects were in any way disappointing. The laser simulators were a little lame with wide and wimpy beams in washed out colours but then again, that's the nature of simulations; they are never as good as the real thing. The lasers on that tour were interesting but average with single and double bounce beam matrixes formed around the performers; a mirror-ball effect and some static grating effects. I kept waiting to see some fancy 15 frame per second, 16.7 million colour, 3D animations on the circular rear projection screen - they never materialised. The source of my disappointment was not the quality of the production but rather the quality of David Gilmour's singing. I guess that after a decade of listening to "Comfortably Numb" sung by Waters, Gilmour failed to satisfy even after making allowances for the inevitable difference between recorded and live performances. With a coveted "Access All Areas" pass in hand, the traffic and parking frustrations behind me, it suddenly all became real and exciting. Soon I would be watching one of my all time favorite rock bands up close and personal; a once in a lifetime opportunity thanks to Rocklight. I entered the backstage area after the show had started. I was warmly greeted by one of the IATSE stage hands who recognised me from other shows we had worked on. He kindly offered to lead me to the laser area. There we were greeted by an irate and hostile laser operator who berated me for being on a "high security" stage even though the IA stage hand and security had admitted me to the area without question. I retreated from the rude verbal barrage and made my way out to the area in front of the sound and light control position to watch the show. The vast proscenium arch was liberally studded with varilights and other fixtures. The huge circular projection screen with it's perimeter of varilights was back but with a twist. This time is was motorised and tiltable so it could be lowered over the band and it's lights used to give a "UFO" like look. The rear projected movie films were crisp and bright. The band had it's own 'sub-stage'' with transparent back and roof. The first laser effect I saw was a simple double mirror bounce. What was striking about it was the intense, emerald green (510.6 nm). Even with several kilowatts of other lighting on the band, the laser beams, emanating from stage left and right, were vivid and solid. As additional beams were added to the array, the brightness did not drop perceptibly. The source of all this wattage is a pair of Oxford Laser ACL 45 Copper vapour lasers complete with a pair of British technicians who start up the lasers then leave for the hotel. These lasers have an output power of 45 watts in pulsed mode with a repetition rate in the 5-10 kHz range and a beam diameter in the 40mm range. The beam diameter is intrinsically large as power output scales with the volume of the plasma. While these specs would be a nightmare for scanned graphics applications, they are perfect for beam effects. Copper vapour lasers do not use a permanent gas fill as in argon and Krypton lasers. The laseing medium is a monatomic metal vapour obtained by heating a plasma tube containing a metal charge using power from an electric discharge. The discharge runs between electrodes at each end of a refractory ceramic tube which is thermally insulated inside a vacuum envelope. The heat generated by the repetitively pulsed discharge raises the temperature of the tube sufficiently to vaporise the metal charge loaded along it's length. The pulsed discharge then begins to excite the metal vapour in preference to the flowing buffer (neon) gas and laseing action begins. For more see the "Laser Basics" article on Copper Vapour Lasers below. During "Wish you were here" a complex array of yellow (578.2 nm) static beams bounced from multiple mirrors to create a web of beams in the stage area. Each additional beam in the array was tastefully introduced on a guitar note. Part way through the song the beams smoothly transitions from the eye catching yellow to the lime green colour. Other songs featured single axis scanned beam effects bouncing out over the audience from remote scanners mounted on the bands' plexi sub-stage roof and beams projected over the audience from mirrors in the back of the stage. There were also arrays of multiple beam scanned arrays projected upward into the night sky, slowly moving "search light" effects and several different static mirror arrays in yellow and green. Looking along the beams as they blasted out over the stadium they appeared to be visible for several kilometres even though there was no smoke outside the stadium. Towards the end of the show some rotating grating effects were used and red scanned beam effects (not as bright and vibrant as the other beams) were projected out over the audience. The red beams were generated by dye lasers pumped by the Copper Vapour lasers. After the concert I waited around for some time to speak to laserist Warren Toll and get the detailed tech tour. He was chronically busy and promised to return later to speak to me - he never did. While waiting backstage I did have a chance to speak briefly with Dave Jarrett of Rocklight who gave me some information on the lasers. The laser crew seemed unwilling or unable to give me a tour of the system. In all fairness though there was a crew party in the offing as this was the middle day of a three day stand in Toronto and the crew were doubtless anxious to indulge in the libations. I have already admitted my biases about the band's vocals from the "Momentary Lapse Of Talent" tour and they were reinforced at this concert. The band just does not sound the same without Waters. The whining tone of many of the lyrics from the "Division Bell" album doesn't help either. Despite the advanced hype ("Lasers so powerful we had to ask the military's permission" and "Gold lasers") eagerly consumed by the press and fans, the lasers did make a dramatic and dazzling contribution to the concert. My overall perception of the event was that of an elaborate sound and light show, topped with lasers and pyrotechnics, where Pink Floyd was playing along. If the Pink Floyd tour has not yet come to your area, grab a ticket and go see the show. The production is spectacular and the lasers lustrous. Marc Brickman, lighting designer for the 1994 Pink Floyd 'Division Bell' tour, chose to use a new type of laser in his package of lighting effects. These Copper Vapour Lasers were supplied by Oxford Lasers inc., of Acton, Ma., and used in projectors built by Rocklite Productions of Toronto, Canada. These lasers were originally developed for use in massive plants enriching uranium for use in power stations. Many hundreds of watts of visible light is required in these applications. Additionally these lasers have been involved in a 'Star Wars' project to improve telescope performance; removing the 'twinkling' of stars by compensating for the turbulent atmosphere. The Copper Vapour lasers produce two output wavelengths simultaneously, emerald green at 511nm and yellow at 578nm. Together these give lime green, or by using a dye laser, the output can be converted to red at 620nm. The green and yellow wavelengths are ideal in that they are close to the peak of the response of the human eye and as such, appear much brighter for a given power output than an argon ion laser. Colour separation is easy with standard dichroic mirrors. Copper Vapour lasers are gas lasers, just like argon-ions, but they have a major advantage: in an argon laser the electrical discharge has first to create ions from argon atoms, then excite those ions to give laser light. The power used in making the ions is wasted. A Copper Vapour laser works with atoms, not ions, so less power is needed and the efficiency is much higher - by about a factor of 10. This means less power required for a brighter beam but, more importantly, much less cooling water is needed. This also simplifies the alignment of the laser mirrors that form the optical cavity. In fact, the output coupler for the Copper Vapour Laser is only a window which provides the 4% reflection needed to maintain laseing. Copper Vapour lasers range from air-cooled, single phase units giving 10 watts, up to water cooled 3-phase, 120 watt models (which only use 15Kw of power). Copper Vapour lasers scale well, if you require more power, simply build a bigger tube. Pink Floyd are using two Model ACL-45 lasers. The laser heads are 2.526 meters (99.4") long by 28.2 cm (11.1") by 37.0 cm (14.6") and weigh 145 Kg (651 lbs. ); the power supply units are 67.5 cm (26.6") by 65.2 cm (25.7") by 75.9 cm (29.8") high (including the wheels) and weighs 230 Kg (506 lbs.) These units give 45 watts of laser output each from only about 7Kw of electrical power. This output is split between the green and yellow lines at about a 1.5 to 1 ratio. The dye laser operates at about 30% efficiency to give up to 15 watts of red. The particular sub-atomic structure of copper atoms means that these lasers are inherently pulsed, typically giving 30 nanosecond long pulses at frequencies (repetition rates) of around 10Khz. At this frequency the beam can't be distinguished from continuous but, if you scan the beam fast enough, the beam separates into it's individual pulses giving magnificent raster effects. Synchronising the scanners with the pulse drive to the laser opens up all sorts of possibilities. The beam from a Copper Vapour laser has another novel feature. The beam diameter of the Pink Floyd systems is 42mm (1 5/8"). This is more noticeable in the air than thinner beams. Copper Vapour lasers have been described as being like "green and gold neon tubes stretching for miles". Even when the wind's up and the smoke's blowing the wrong way, the crowds stand and watch the beams disappearing over their heads and into the clouds. Copper Vapour lasers run off a mixture of copper and about 30mbar of pure neon gas. The copper lies in pieces down the length of the ceramic laser tube and is heated up by the discharge to give off copper vapour. The copper runs out slowly and when it does (after about 300 hours), you have to take a window off and push more copper down the tube - a process which takes an hour or so. To keep the tube clean the laser automatically runs a slow flow of neon gas through the bore. Again, a bottle of neon gas will last hundreds of hours. With a similar divergence to argon lasers, a Copper Vapour laser beam keeps it's size for long distances. One consequence of this is that when the tour is playing at open air venues and is projecting unterminated beams, it has to work with local Air Traffic Control to declare an exclusion zone around the stadium. This isn't always too effective - at the first show in Miami last spring, the local airport's control tower put out an "all points bulletin", warning pilots to keep away from the Dolphin's Stadium. Within half an hour we had the Pink Floyd Blimp, two light aircraft and a helicopter circling overhead. So far the Pink Floyd tour has played to 4.25 million people in North America, and is now in mainland Europe. Everywhere the show has played it has done nothing but enhance the band's reputation for putting on a visual extravaganza. This has been in no small part due to the laser show. Rick Slagle, Oxford Lasers Inc., Acton MA. John Abbott, Oxford Lasers Ltd., Abingdon, UK.